You’ve been looking for a new position to apply your skills. And you came across a company that sparks your interest. Their company culture is exactly what you’re looking for, and they have a position that is perfect for you, so you apply. They email you with next steps, asking you to complete this thing called a “video interview”. Sounds vaguely futuristic and foreign to you, being used to phone screens and in-person interviews. These are well-known hurdles for you to overcome. But this video interview thing? Not in your wheelhouse… yet. The majority of internet providers give enough upload and download speed for a video interview. But if you run into a laggy video playback, or out of sync video, it might be the fault of your connection speed. To check your internet speed, visit speedtest.net (or download the app on mobile) and tap or click “Go!”. The page will give you two numbers: your upload and download speeds. For a Spark Hire one-way video interview, the minimum upload and download speed is 2 Mbps. While video interviewing platforms work on all internet browsers, some simply work better than others. Using the correct browser allows you to complete your video interview as easily as the platform’s designers intended. We recommend using Google Chrome to complete your video interview. If you don’t already have Google Chrome, you can download it here. Should you have technical issues, look to the video interviewing platform for assistance. If your video interview platform is Spark Hire, you can contact support@sparkhire.com for help. Most video interview platforms allow you to complete your video interview with a webcam (attached to a desktop computer/laptop) or mobile device. No matter which you choose, there’s a strategy to how you position it. First, the webcam. Sit up straight, feet flat on the floor, where you intend to complete your interview. Securely place your webcam directly at eye level. On a laptop, this may mean putting a book under your laptop to bring it to the right height. Alternatively, you can use a mobile device for your video interview. First, rotate your device from its vertical orientation to horizontal. Hold your device in your dominant hand, and rotate your device so the camera is facing away from the palm of your hand. 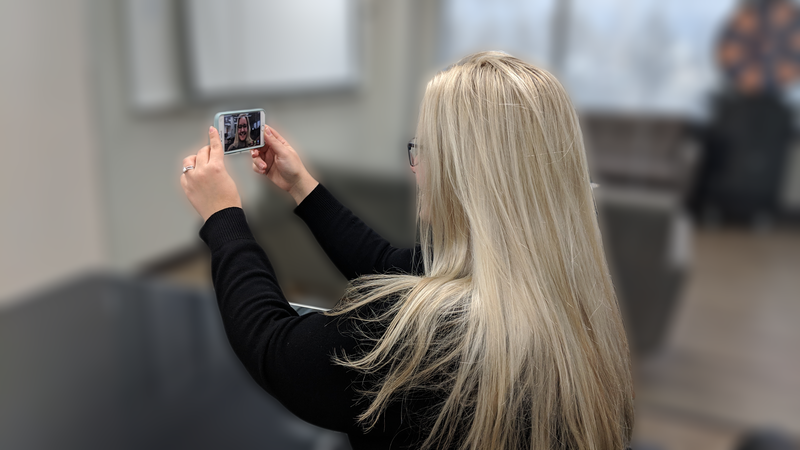 Holding your device correctly allows those reviewing your video interview the best view of you and allows them to hear you best, as you will not be covering your microphone. Bring your device up to eye level such that your arm is slightly bent. Bending your arm allows you to be more comfortable and physically relax during your recording. When you begin recording your video interview responses, resist the urge to look at yourself in your screen! We all know eye contact is crucial in an in-person interview, and is also the case in video interviews. To make eye contact with your interview reviewer, make eye contact with your camera or webcam, instead of your reflection. Yes, you may want to just get your video interview over with, but it’s important to consider what’s going on behind you when recording. Video interview allows you the flexibility of completing your video interview at any time of the day, from anywhere. But just because you can record your video interview anywhere, doesn’t mean you should. For example, you could record your video interview in your car. Picture your professionally-dressed self, hair going wonky pressed against your headrest, unpredictable shadows as people walk around your car to get to their destination and echoing acoustics. How would that look to those reviewing your video interview? Like you don’t care about your video interview, exactly. So choose the background for your video interview wisely. You don’t have to scrounge around to find a completely blank white wall for your background, but you should be aware of offensive and unprofessional backgrounds. The best way to pick a background is to consider what area you can control where your recording sounds good. Good places to record your video interview include your desk at home, kitchen table, or office. If you live with others, make sure they are aware of your video interview and do not interrupt your recordings. With these 5 video interviewing tips, you are ready to complete your video interview. For a more in-depth dive into completing your video interview, check out Spark Hire’s Candidate Bootcamp.